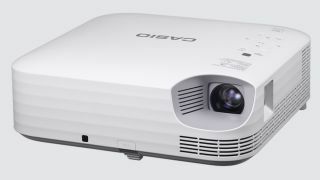 The What: Casio America introduced its new Superior Series of Lampfree projectors at DSE 2019. The company’s latest LampFree projectors are designed for digital signage and offer benefits including high brightness, low maintenance, and installation flexibility. The What Else: The Superior Series features the next generation of Casio’s mercury-free LED and laser hybrid light source. The new R-Hybrid Light Source technology produces clear images and bright colors with a service life of up to 20,000 hours. The Superior Series also features Casio’s new dust-resistant design, which helps to prevent the deterioration of brightness. The Bottom Line: Suited for the presentation market, Casio’s Superior Series of LampFree projectors offers brightness up to 4,000 lumens and can project large images of up to 300 inches. As the company’s first WUXGA projector series, the new models provide full HD resolution, and with a 1.7x zoom lens and 360-degree installation angle capability, the Superior Series increases flexibility with installations as the projectors can fit into a variety of tight places. In addition to the new Superior Series models, Casio’s LampFree Advanced Series and Ultra Short Throw Series will be introduced later this year. The Superior Series models will become available in Spring 2019.